The out of the box experience. Installing and running Pharo 3.0 on a blank Mac OS X 10.9 account in 40 seconds. With 3 extra minutes to demo some networking and image manipulation interactions. Installing and running Pharo 3.0 on a blank Windows 8.1 machine in under 1 minute. With an extra minute to demo some elementary interactions. The hacker experience: using ZeroConf to get Pharo 3.0 up and running in a blank Ubuntu 13.10 (32-bit) account in 1 minute flat. Doing some HTTP hacking in the next 5 minutes. Includes terminal headless execution as well. Please note that there are alternative ways to install and run Pharo [ http://www.pharo.org ]. In addition Damien Cassou developped several installers for Windows, Mac and Linux. We would really like to push business in our community and we believe that it is important to create a community around business questions. – share technical assets from a business perspective (which frameworks for what). We hope that you will like the idea and that more business can emerge! Stefan Marr is doing an important job for the VM. He worked on the virtual machine simulator. Over the last years, people have been tinkering with the simulator from time to time, but I have the feeling everyone gave up before the thing was fully functioning, and not even the trivial things have found their way back into the VM code base. I am aware that Phil was busy with it recently, but I think there was also someone else posting notes here. Would be great if those people could send me their change sets so that I can try getting everything working again. The simulator loads up properly, and executes the first 10,000,000 bytecodes. Which is enough to make it notice that a primitive fails, and to pop up the error dialog. However, it is a Pharo 1.2 image. Later images trigger some bug, I haven’t identified yet. They execute code, but don’t manage to bring up the display. 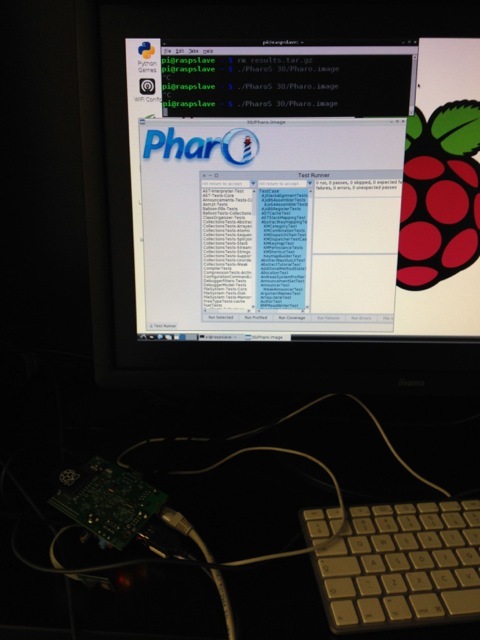 After some efforts, fighting with cross-compilers (cross assemblers) Jean-Baptiste Arnaud finally fixed the PharoS bug on Raspbian and now Pharo http://www.pharo.org runs totally on Raspberry. Well done JB. I made some advances and cleans for the RaspberryPi, compilation. I cross compile from an unix slave, that is really faster and this allows me easily to compile the fast bltbit file. We have a small bug on the git tracker now but once it will solve the job will automatically follow the update. The version downloadable should work. We compile the StackVM now for RaspberryPi based on a Raspbian os. You will find a preconfigured image in the image folder. all the used source code is in mc use the filetree in montecello. I have done a configuration to generate VM on raspbian. StackRaspbianConfig, you need to subclass and add your plugin + configure Cmake as you want. and recompile (cmake . & make from a terminal in build folder) on the Raspberry Pi, it should work. My jenkins job actually take the last version of the source VM, and it is able to rebuild it on RaspPi. You can cross-compile but I do not explore that way.